During my quick and very sudden visit home last week, eating out was pretty much the last thing on my mind. For the first time in two + years, I pushed my restaurant list aside and gave 100% of my attention to my family. However, food still has its way of creeping back to get my attention. 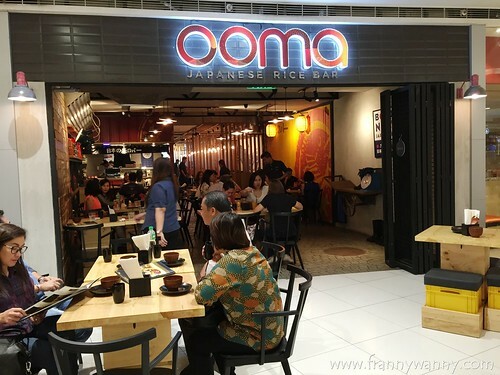 As we were running some errands at SM Megamall, we chanced upon Ooma Japanese Rice Bar which has been getting a lot of good raves from friends and from my very own sister too. As Pan and I were planning our trip to Megamall, she told me that she wants to have lunch at Ooma so that Paul and I can try it too. We agreed to meet at the entrance of Ooma Japanese Rice Bar at exactly 12 noon and guess what?! I was the first on the waiting list! The restaurant was quite spacious so just imagine that it was immediately filled even before lunch hour. The wait was short though and in no time, we quickly got a nice cozy table for 3. 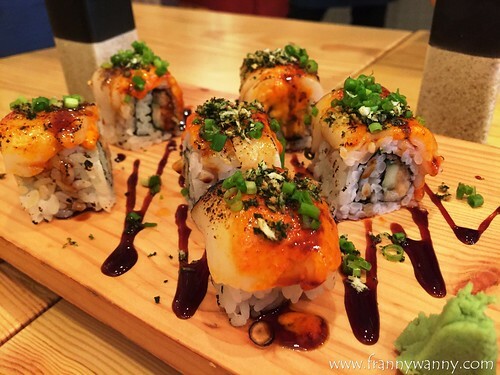 First on the list was the Scallop and Tuna Aburi Maki (Php. 295) which was such a pretty creation. 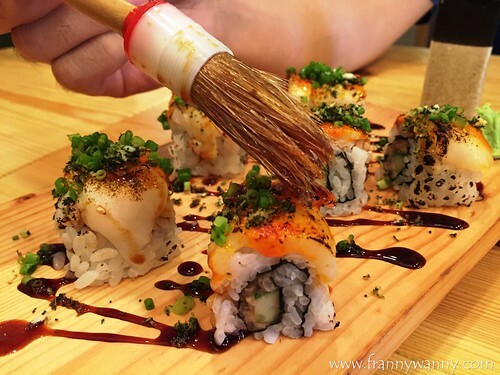 Five bite-sized sushi rolls on top of a wooden board came to our table as each was filled with tuna, cucumber and topped with torched scallops. What made it so delicious was the combination of teriyaki sauce, spicy mayo and kimchi aoili. Pan taught us that the best way to enjoy this was to brush a small amount of soy sauce on top of each piece and eat it together with some wasabi too. I would love to say that it was over-the-top delicious but to be honest, I had a really hard time determining the taste of the scallops and the tuna too. I think there was a bit too much going on in this lovely creation that the flavor failed to stand out. It was good but I think I'll try something else next time. 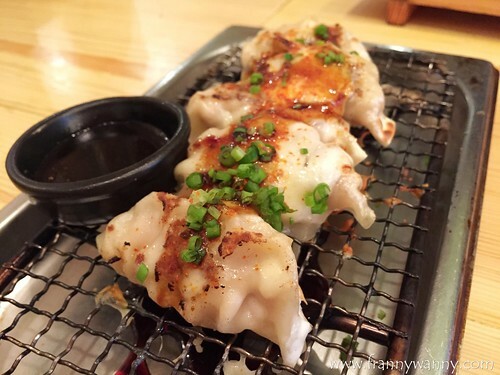 We also tried the O-Gyoza (Php. 235) which was a set of 5 pieces of gyoza stuffed with grated mozzarella and cream cheese. While it was on the pricey side for 5 pieces of gyoza, I enjoyed this modern take on one of my Japanese favorites. As Ooma is a Japanese Rice Bar, they stayed true to their name but offering unlimited Japanese Rice with every order of Hot Plates! Yay! So, we ordered the Buta Kakuni (Php. 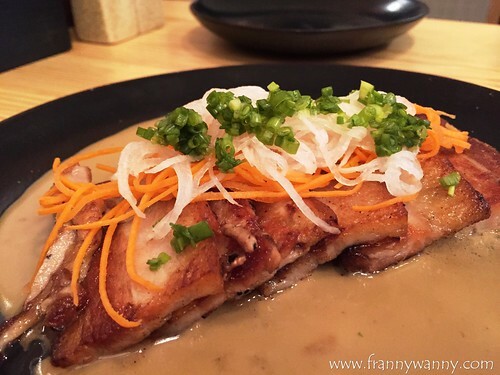 365) which are thin strips of slow roasted pork belly with pickled carrots, radish and scallion drizzled with coconut sauce. It was good but in every bite, I get that guilty feeling as I bite into that soft pork fat. It was so bad but so good too! I promise I tried to stop after the first piece but it was just loudly calling my name. 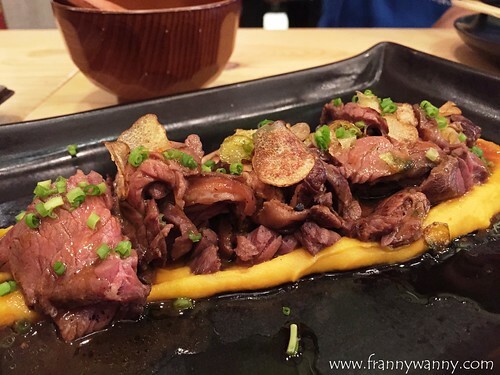 Together with the Buta Kakuni, we also had the Hanger Steak (Php. 495) which was highly recommended by most friends. What's there not to like? Sous-vide hanging tender with sauteed mushrooms, sweet potato mash, crispy baby potato chips and white truffle oil. I immediately caught the delicious truffle scent from the moment the dish was laid down in front of me. While it was a bit on the salty side, I loved it! The meat was so tender and the flavor was the cause of many daydreams thereafter. Lastly, we initially wanted to get another Hot Plate but as I scanned the last few pages of the menu, my eyes zeroed in on one menu item -- Uni Udon (Php. 495). We all love uni and it has been years since we had one. 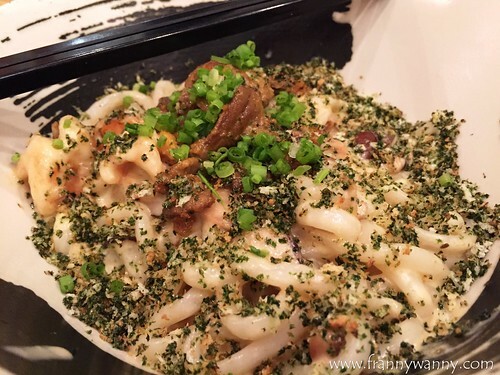 So, why not try it with udon noodles?! I have to warn you though that they somehow scrimp on the uni serving but you'll love how "qiu qiu" the noodles were. The uni cream sauce reminds me so much for the classic carbonara. It's good but remember to share this as one may be too much to be consumed solo. We had a great time at Ooma mainly because of the superb service that we got that day. Given that they were so full during lunch hour, we hardly had to raise our glasses to be refilled as all servers were just so alert and attentive. I'm glad that Pan brought us to try Ooma as it was definitely the main foodie highlight of my trip back home. Ooma Japanese Rice Bar is located at 3rd floor, SM Mega Fashion Hall, Julia Vargas Avenue, Mandaluyong City. Call them at 656-4591 / 0917-5392083.